KoopaTV: Asinine Attorneys, Dai Gyakuten Saiban 2, and Ace Attorney Anime Dub! Asinine Attorneys, Dai Gyakuten Saiban 2, and Ace Attorney Anime Dub! By LUDWIG VON KOOPA - Respectively to the title: Give money, beg, and wait to enjoy. 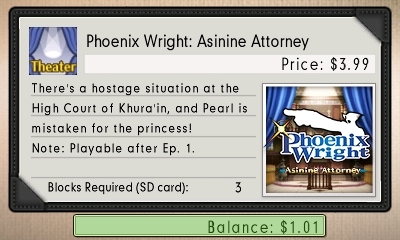 Phoenix Wright: Ace Attorney — Spirit of Justice has a very good second case. That said, this Case 1 isn't really short like some of the other Case 1s in the series. It has a ton of scripting and sound efforts work put into it, as CAPCOM will be quick to tell you. Case 2 puts a MEDIA figure as a villain, so... that's right up my alley. 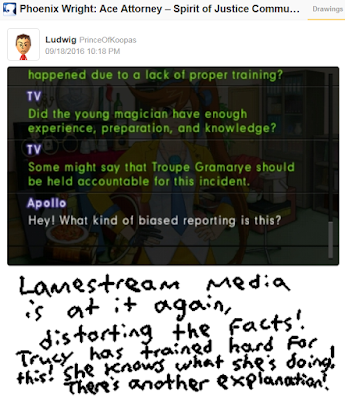 KoopaTV readers know how much I love to trash the media! 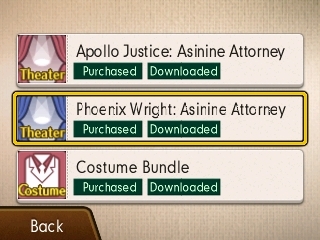 So, because I'm so impressed, I went ahead and bought the two Asinine Attorney short episodes for $3.99 each after one was released last week and the other released today, without even knowing anything about 'em. I think you should do the same. Phoenix Wright: Asinine Attorney! It's...something playable. Tip: If it is Ace Attorney downloadable content, it is NOT available to order through the eShop. In order to purchase these bits of DLC, you need to make a save file for the game. Oh, for these, you need to complete Episode 1 in order to play them. After that bit of enjoyment, go to the DLC/Spotpass part of the game's main menu, and to the part where you can purchase DLC at the bottom right. They're 3 blocks each (INCREDIBLY lightweight on a system with thousands of blocks of memory) and probably worth it. They ALSO come with 3DS home menu themes! Pixel art of Wright in Khura'in and Apollo in America. WITH music! Wright's has that Ahlbi dweeb in the bottom screen, so Apollo's is better with him, Trucy, and Athena in a magician's hat. I haven't actually touched these because I gotta write a damn article today. Ugh. ...Oh, uh, did I write that? Notice that I filled my balance with $10 more than last screenshot. You can do the same thing by winning the free-to-play KoopaTV Loyalty Rewards Program! There's still going to be a FULL episode of DLC for $6 out next week. I probably won't dedicate a whole article to its existence, so be sure to remember it for yourself. Not that there's a rush, I guess. There is also not a rush to get Dai Gyakuten Saiban localised, also known as the Japan-only spin-off that features Sherlock Holmes and takes place in the Meiji Era. WELL, now it's getting a sequel! That will mean this sequel, the prequel, and Ace Attorney Investigations 2 will all not be localised. That doesn't have to be a permanent situation, though. CAPCOM can only localise one Ace Attorney game at a time. It turns out that Phoenix Wright: Ace Attorney — Spirit of Justice was decided to be a higher priority than spin-off games, which makes... perfect sense. CAPCOM in Japan needs to just stop making new Ace Attorney games so CAPCOM in America can play catch-up. America will still get what seems to be a steady-ish stream of “new” content, while Japan can enjoy their random live action productions. Seriously, Japan gets so much extra stuff. Don't feel bad for 'em. In other Ace Attorney news, the Ace Attorney anime is going to be dubbed eventually, instead of just being sub-titled (expertly) on Crunchyroll. I'm a bit concerned that some people, like RawkHawk2010, will just watch the anime and think that it's a substitute for playing the games. He's had Phoenix Wright: Ace Attorney Trilogy for a long time now, and hasn't played it. I'm fully blaming the anime. They're NOT substitutes! Well, whatever manages to get localised, BUY IT! 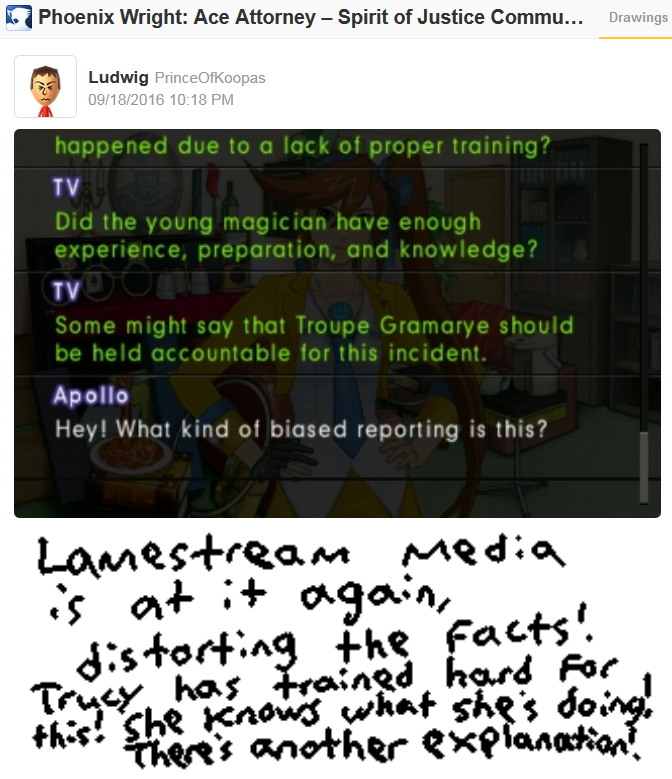 Ludwig caved in a week later and actually purchased the rest of the Ace Attorney 3DS Home menu themes. The eventual anime dub is done by Funimation, and will be out in January 2018. 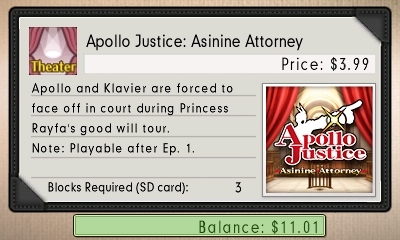 I'm waiting to get the Asinine Attorney episodes until the full DLC case is out so I can buy them all together. I've heard the AA episodes are very short, but I still want to play them. I do think our chances of getting DGS are better now, not only because 1) the sequel should fix the loose end complaints and 2) the localization team is done with Spirit of Justice, but also because many people were concerned it might be "too Japanese" and one of the cases in Spirit of Justice is so Japanese they must think we're capable of handling it now. About the anime, when it first came out, I thought it might be acceptable to watch it to catch up on the stories in place of the games. I no longer feel that way. The anime is entertaining, but it's a bit rushed, and if I didn't already know the story, it might really feel rushed and strange. This whole "too Japanese" thing was always silly. It doesn't break the established canon at all to just say Wright's ancestors are Japanese. Do you know if there is a preferred order to play the DLC in relation to the cases? Such as, the DLC case in Dual Destinies chronologically took place in-between... Cases 2 and 3, right? I'm not sure about the Asinine Attorney cases (aren't they non-canon anyway? ), but I read that you'll have to clear the main game to play Turnabout Time Traveler. Well, guess the clear-the-game restriction makes it pretty clear where Turnabout Time Traveler stands in this. *also, that should be "shouldn't watch it until after he plays the game"
I just finished Case 2 of SoJ, and I'm wondering how much less the impact would be if one never played Apollo Justice. I updated my "order to play" guide to recommend playing Apollo Justice before SoJ. In general, SoJ seems to draw on the series' history much more than DD did. Yeah. I love Spirit of Justice, but I wouldn't recommend it as someone's first Ace Attorney game. And... I guess it probably won't work as someone's second Ace Attorney game. At the very least, it could be your... fourth? AA1, Apollo Justice, and Dual Destinies. (You don't need Justice For All — at least so far, and you don't need Trials & Tribulations to fully appreciate the Kurain Spirit Channeling Technique). At that point, they might as well just play them all. Okay, to go back to the earlier question, the eShop lists all three pieces of DLC as playable after you clear the first case. However, Turnabout Time Traveler is set after the main game. Looks like you're correct about when it's playable. I won't touch it or the Asinine Attorney episodes until after I finish the main game, though. Just finished case three. Great case! Now on to case four! I must've played Trial Day 1 for, what, 3 hours? Still going on! It's... entrancing. I do not know how well the spin off sold in Japan, but I have a feeling that it would fare much better over here. Spirit of Justice just puts one step closer to finally receiving these gems. A feeling? Based on wot?